Weekly Menu contains days, groups and items. Go to Components » Phoca Restaurant Menu » Weekly Menu. First action which should be done, is saving information in Settings. Link to Settings can be found in Toolbars. Multiple Edit - edit all groups and items of this day at once. You can create Groups for this Day. Click on Groups icon. After successfully adding of Days, Groups, Items and information in Settings you can create menu link to this Weekly Menu in Menus. In your Joomla! administration site go to Menus - e.g. Main Menu and click on New (create new menu link). Select Phoca Restaurant Menu - Weekly Menu. 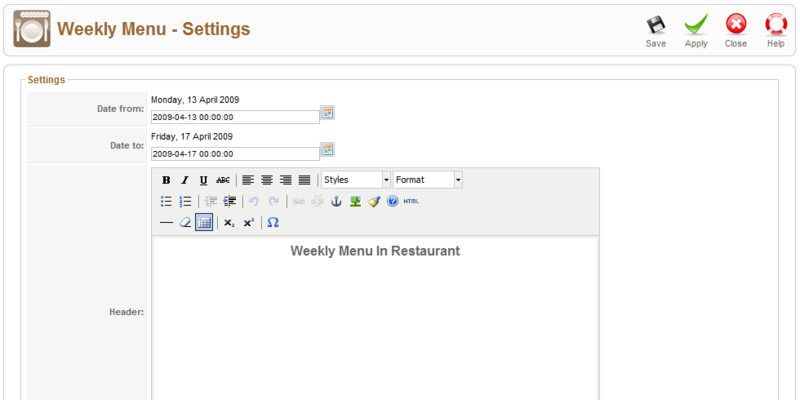 Add Title and Alias and set Parameters (Basic), Parameters (Component) and Parameters (System) and save this menu link. Now on your site (in frontend) link to Weekly Menu will be created. 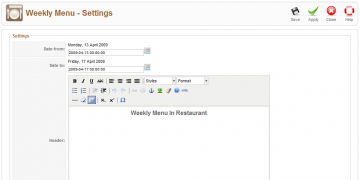 After clicking this link, Weekly Menu will be displayed. Display Date Title - display or hide Title of the date (e.g. if you are displaying more than one day, you can display the Title for all days. 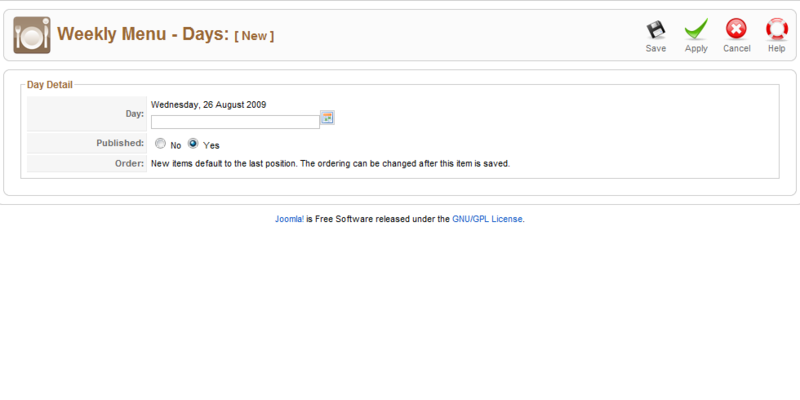 If you are displaying only one day, maybe you want not to display the Title as this can be included in Header). Settings - set Header, Footer, Day From, Date To and Meta tag information.